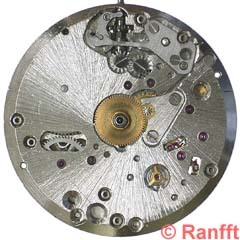 The self-winding gear is integrated in the movement, instead of attaching it to a manual-wind calibre as usual. 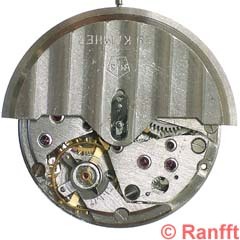 Together with other design details, this led to a sensationally thin but still rugged movement at that time; only contemporary movements with micro rotor (e.g. Buren) were thinner. 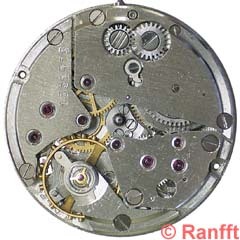 The minute wheel A is not as usual placed in the center, where now only height is needed for seconds pinion and rotor post. Moreover it is driven by the barrel B over an intermediate wheel C, allowing to place it aside the barrel and not partially above. Depending on the revolution direction of the rotor, the rocker wheels (Fig.4) drive either directly or via intermediate wheel D the ratchet wheel E (click not shown). 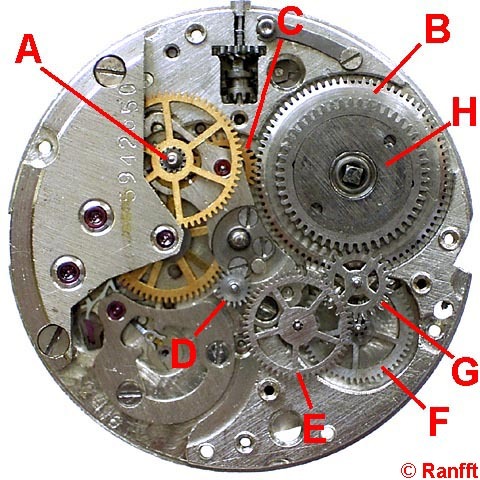 Over the gear F and an intermediate wheel G the winding energy is transfered to the ratchet wheel H on the barrel B. So the only purpose of the intermediate wheels C and G is to place train, self-winding assembly, and barrel in one layer without overlapping each other. So a low profile is achieved without concession to stability. The ratchet wheel on the barrel consists of two gears over each other, coupled to the center section by hook levers. 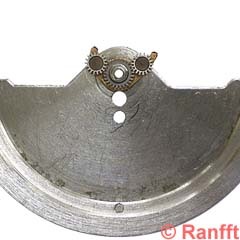 So the barrel can be wound independently by hand over the top gear, and automatically over the lower gear, via intermediate wheel G. This yields a softly operating manual winding, and reduces wear.